Both my children have been swaddled straight from birth and after a couple of weeks we moved onto sleeping bags and cellular blankets. Finn wore sleeping bags until he was nearly 2 years and I think it will be the same for Molly-May. There is only one slight problem, she is such a wriggler at night so the sleeping bag always got twisted and in the morning she woke up with the sleeping bag tight around her shoulders due to everything being twisted on the bottom! So I started looking around for alternatives because no sleeping bag wasn’t a option she always kicks away her covers and mostly sleeps on top of them come the morning! And the I found the perfect solution! Somebody was actually clever enough to make sleeping bags with feet! Slumbers sleeping bags with feet are great for helping your child as they learn to walk and explore their world for the first time! Toddlers can enjoy the comfort and security of their sleeping bag while still being able to move about freely. The innovative sleeping bags are designed so that your child’s feet fit inside the sleeing bag when sleeping and when they wake up they can pop their feet through the openings and walk or crawl around in it! Slumbersac’s are made from soft 100% jersey cotton, lined with 100% cotton and padded with soft quick-dry polyester fleece. We have been using the sleeping bag from Slumbersac for the last two weeks and I am converted! So much so that I will be selling all my old sleeping bags and get a spare one! It washes really well and stays as soft as it came out of the package! 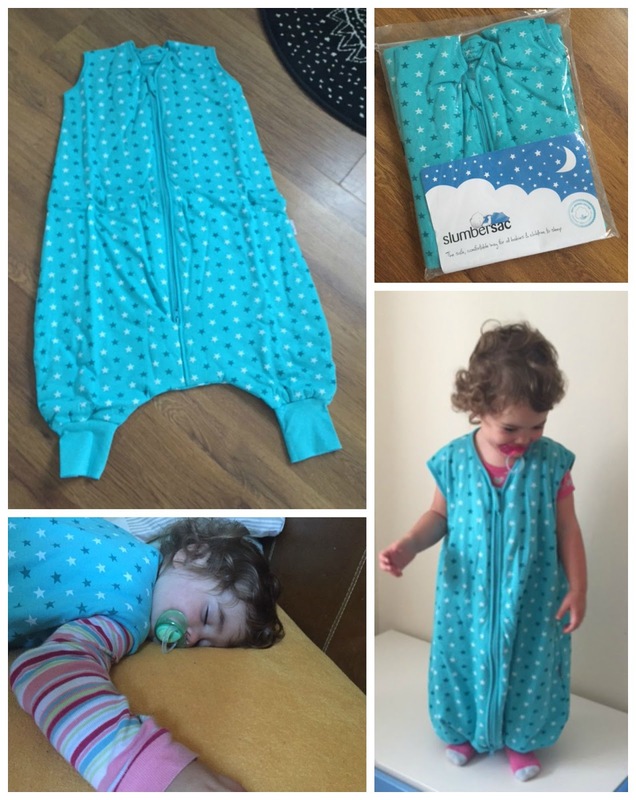 The Slumbersac sleeping bag came especially handy over the last week when Molly-May came down with croup and fever and just wanted to cuddle and sleep and repeat! So i could leave her in her warm and cosy sleeping bag after her nap whilst cuddling with her on the couch. I love the fact that they have such a cute unisex star design and the turquoise is such a nice colour. The Slumbersac’s are priced from £18.99 – £22.99 and come in 4 different sized from 12 month up to 4 years and 3 different tog sizes from 1 tog up to 2.5 tog. You can check out the full range over at www.slumbersac.co.uk. Another cute little details is that you can personalise your sleeping bag with your child’s name for a added £5.95 or even make it the perfect christmas gift for another little one! Disclaimer: I have been send a Slumbersac for reviewing purposes, but all thoughts and opinions are mine.